Fossil Vertebrate Identification Guide for Aurora and Coastal North Carlina - Pungo River and Yorktown Formations. 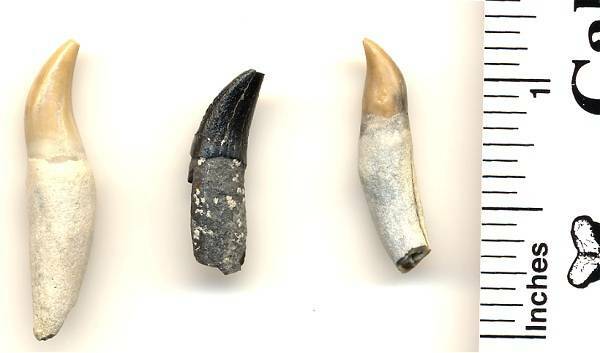 Besides the abundant shark fossils found in coastal North Carolina, other vertebrates are also found. The most common are marine mammals, such as ancient dolphins and whales. Other vertebrates include pinnipeds, reptiles, and ocean going birds. Squalodons are shark toothed whales. They are a medium sized toothed whale with a long snout full of serrated teeth. Squalodons are less common than the more modern looking whales found in the Miocene deposits of North Carolina. 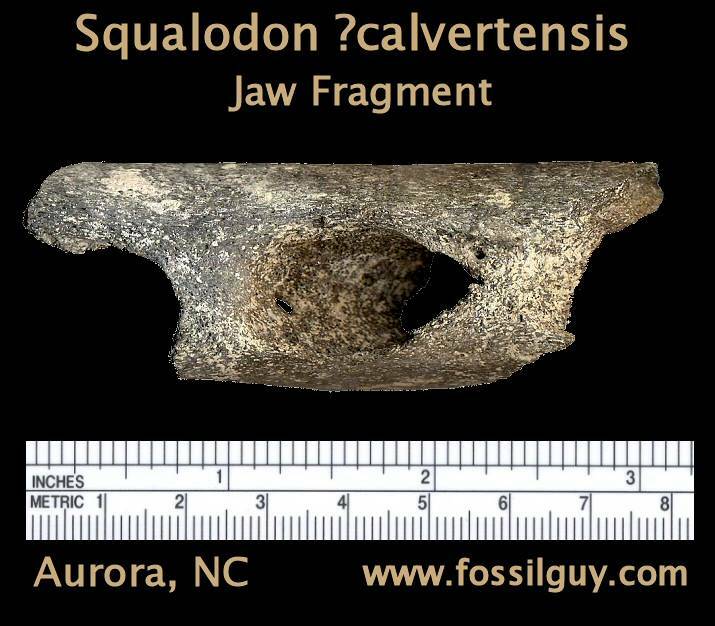 To learn more about squalodons, go to the squalodon page. This tooth with a broken root is probably a molar. It comes from the Pungo River formation of Aurora, North Carolina. 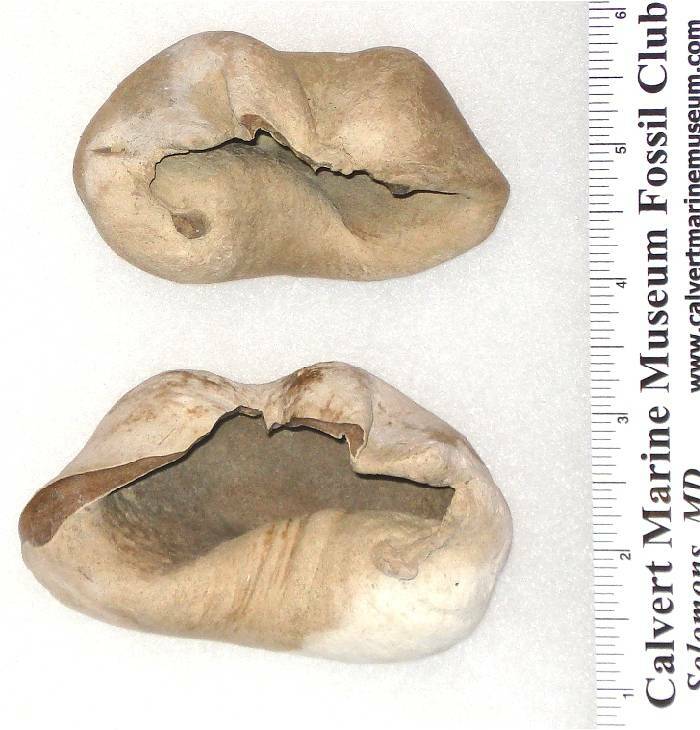 This is another molar with a broken root. It comes from the Pungo River formation of Aurora, North Carolina. 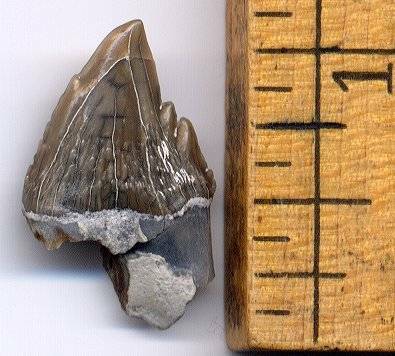 This is a squalodon incisor. Unfortunately the tip and root are broken. It comes from the Pungo River formation of Aurora, North Carolina. This is a small jaw section from a Squalodon. Notice the large tooth socket. 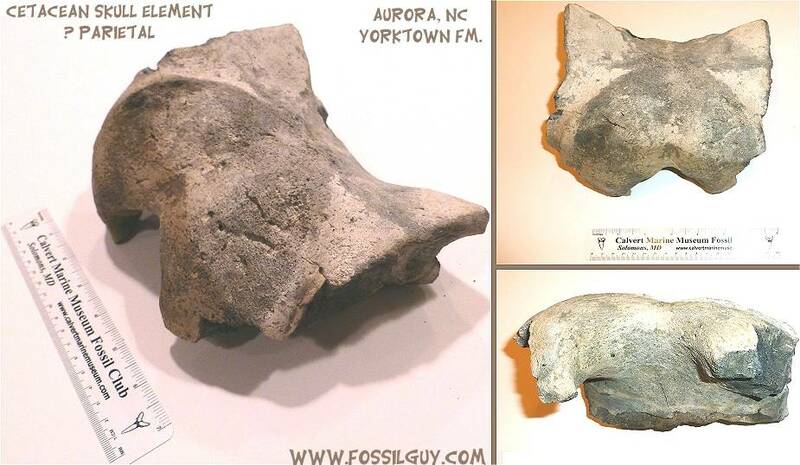 It comes from the Pungo River formation of Aurora, North Carolina. There are many different genus and species of dolphins in the Pungo River and Yorktown formations. 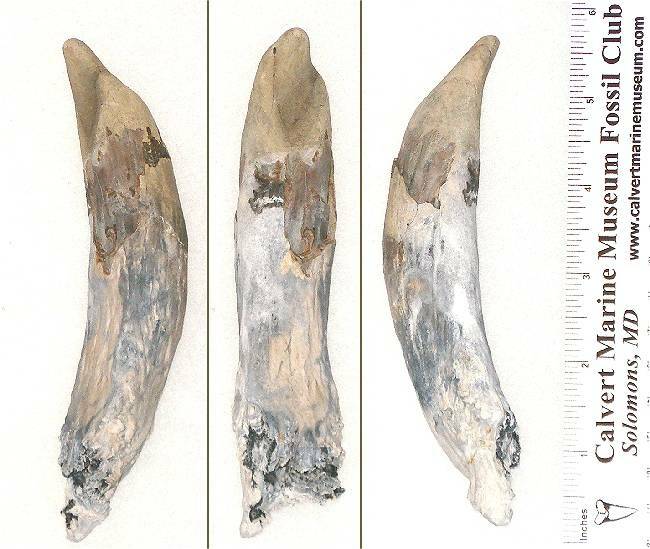 Most of the time, the remains are fragmentary, such as isolated teeth and bones. Unless a skull is found, identification to even the genus level is very difficult, if not impossible. 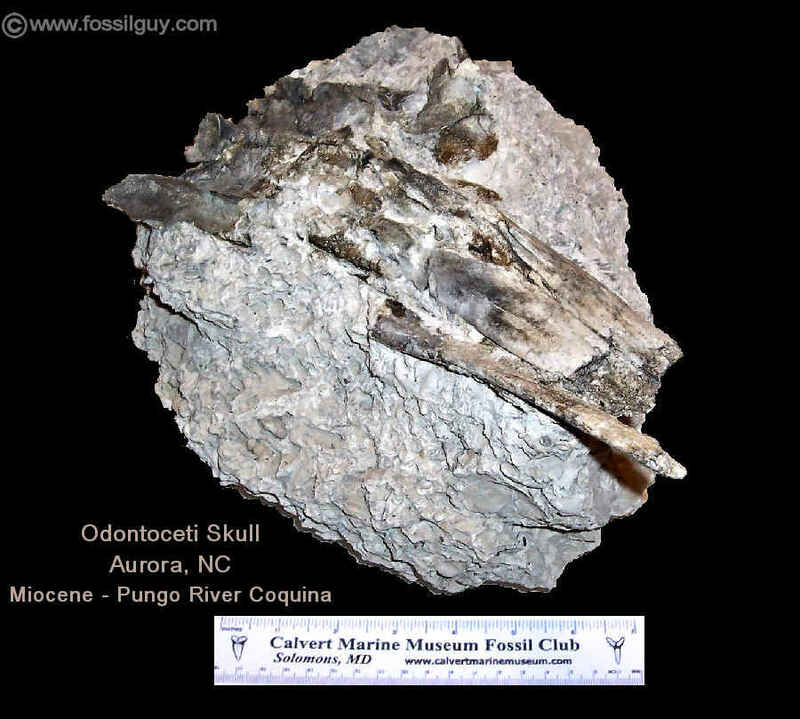 This is a mangled skull of a small type of dolphin in a limestone cocuina from the Pungo River formation at the PCS mine in Aurora, North Carolina. 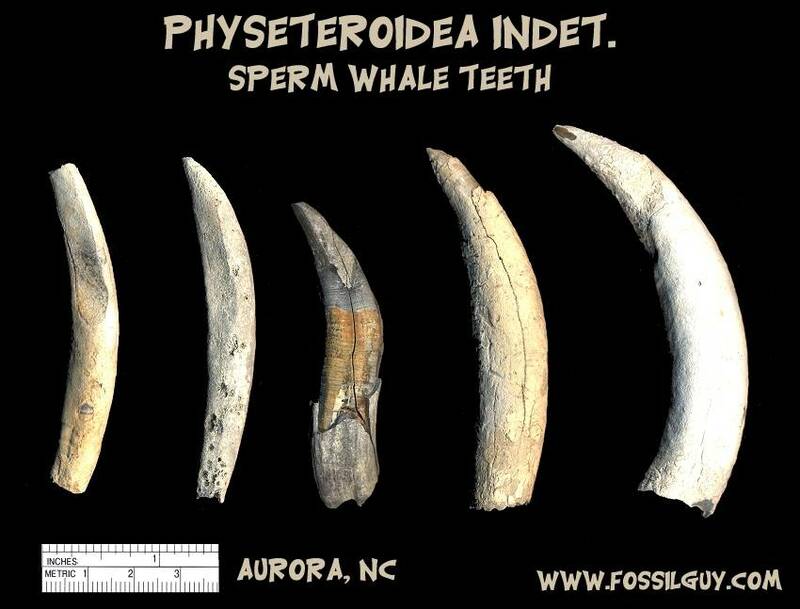 Isolated teeth are a fairly common cetacean find in North Carolina. Dolphin type teeth are a common cetacean find. However, they often get overlooked due to their small size. They range anywhere from around .5" to 1.5" in length. Identifying isolated teeth to a genus is nearly impossible. Jaw fragments are sometimes found. Most are not identifiable to a genus level except for Eurhinodelphis. Eurhinodelphis jaw sections have closely spaced tooth holes. The holes are small and the jaws are very long and narrow. To learn more about Eurhinodelphis, view the Eurhinodelphis Gallery Page. 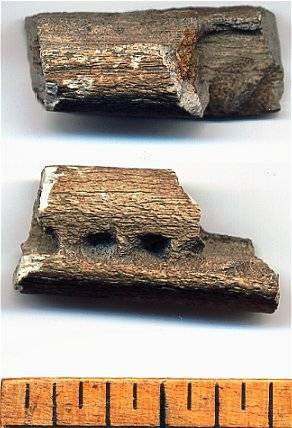 This is a fragment of the jaw of some type of dolphin like animal. Notice the very small tooth holes. 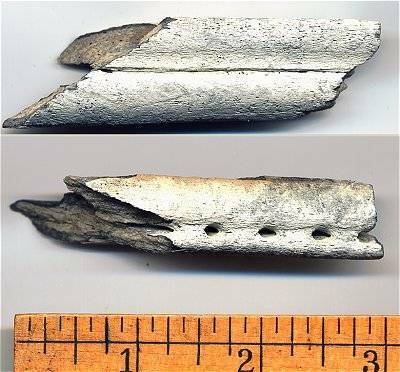 This is another fragment of the jaw of some type of dolphin. The ear bones (the bulla and periotic) of dolphins are very dense and therefore are usually the best preserved bone elements of the skull. Well preserved ear bones can be used to identify the genus and even species of cetacean. 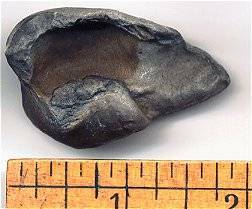 This bulla is small and probably from a dolphin like animal. Periotics are easy to recognise due to their unique shape. Each species of toothed whale has a slightly different shaped Periotic. A cetaceans flipper has all the arm and hand components of any other mammal. 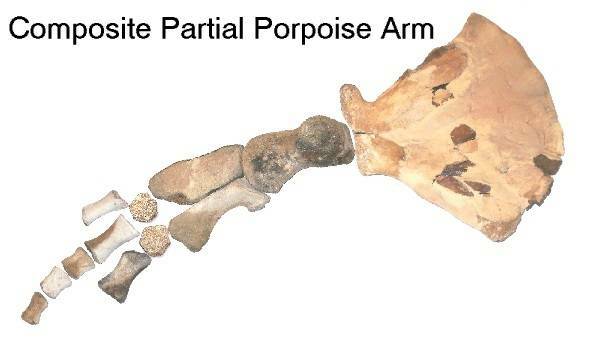 The image below is a digital composite reconstruction of a partial fossil dolphin arm using fossils found at Aurora, North Carolina. Composite reconstruction of a partial fossil dolphin arm using fossils found at Aurora, North Carolina. 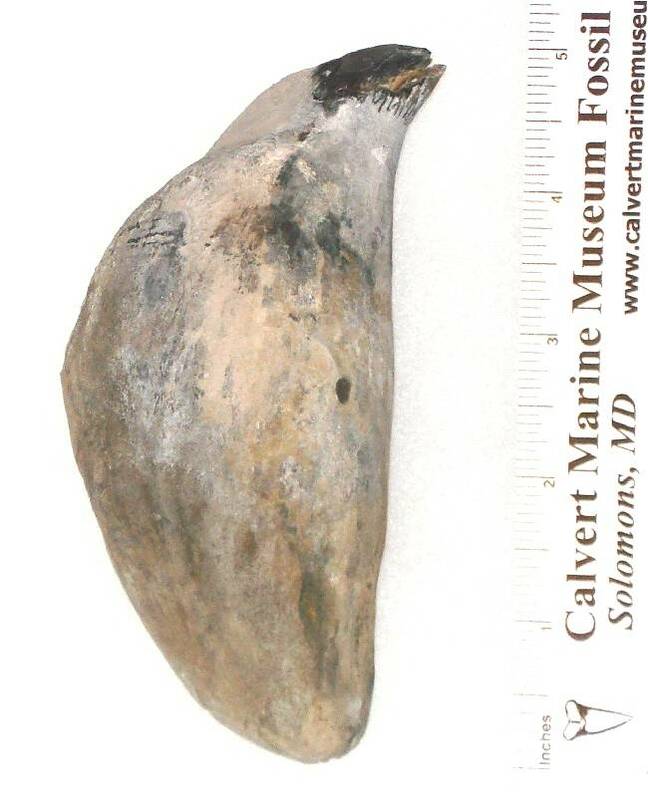 The Scapula is from the Calvert Cliffs of Maryland. From this bone, the Radius and Ulna attach, then the Carpals and Phalanges (fingers). Identification based on Timmerman (1997, p. 66). 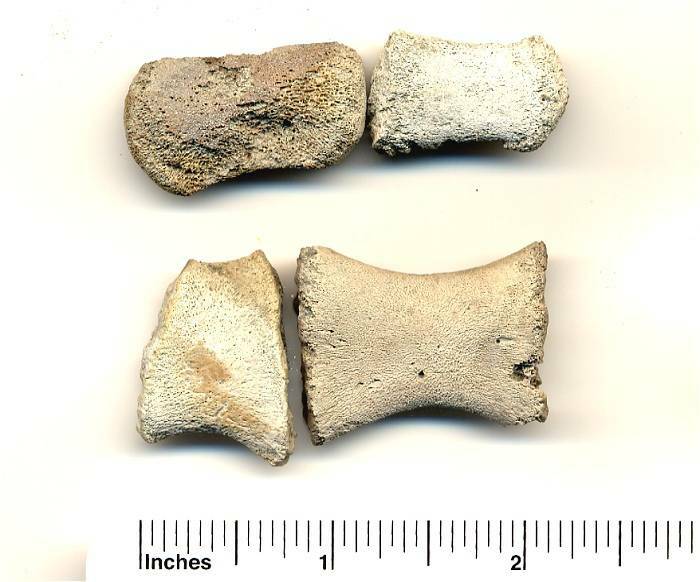 The small size and odd shape of this bone makes dolphin humerus bones easy to identification very easy. The Humerus is shaped slightly differently from species to species. The Ulna is in the forearm, and runs parallel to the Radius. The Ulna and Radius connect the Humerus to the carpals and phalanges (hand). 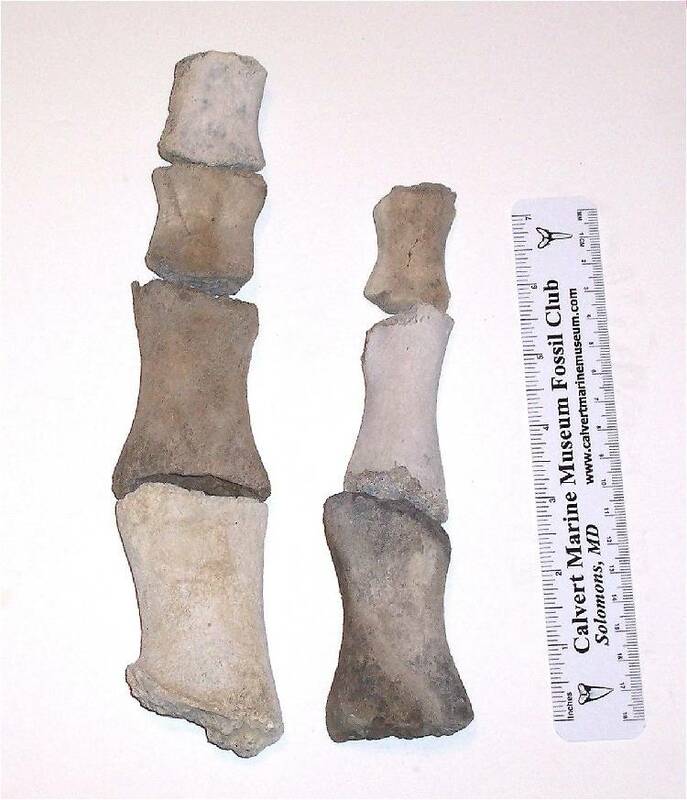 These are Ulna from dolphin like animals. The leftmost one is a profile view. The shape of the Ulna varies depending on the species. The Radius is in the forearm. It runs parallel to the Ulna. The Radius and Ulna connect the Humerus to the carpals and phalanges (hand). These are Radii from various dolphins. The leftmost one is a profile view. The phalanges are the finger bones. They tend to be very small and flattened. 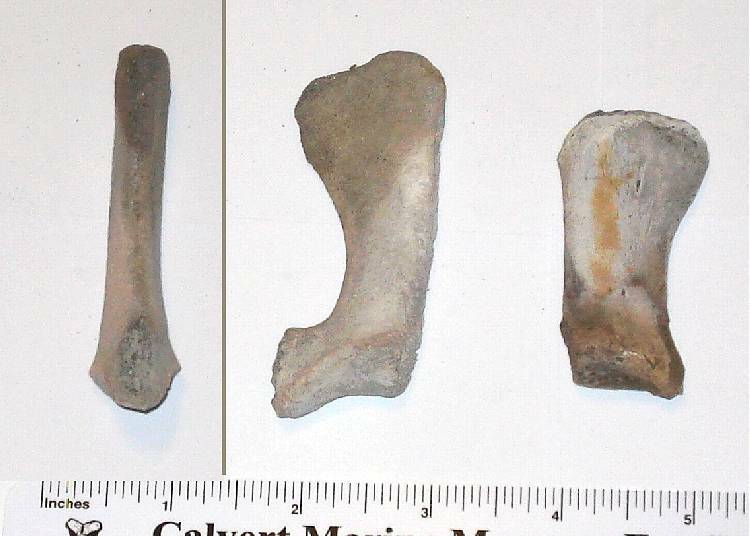 Small whale phalanges and dolphin phalanges are impossible to tell apart without associated remains. Therefore, some of these could be small whale phalanges. Due to their size, dolphin phalanges are often overlooked. 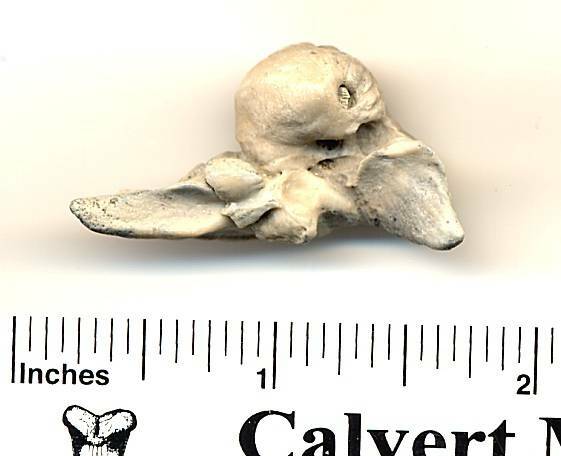 This is a thoracic vertebra from some kind of very small dolphin species. 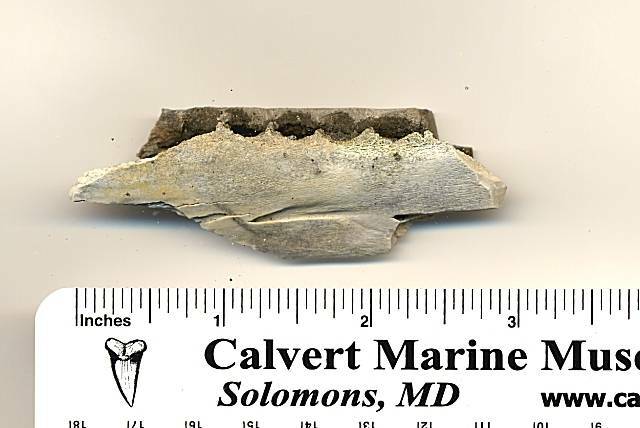 This is probably a dolphin Caudal, or tail, Vertebra from the front of the column. The processes are severely reduced in caudal vertebra. 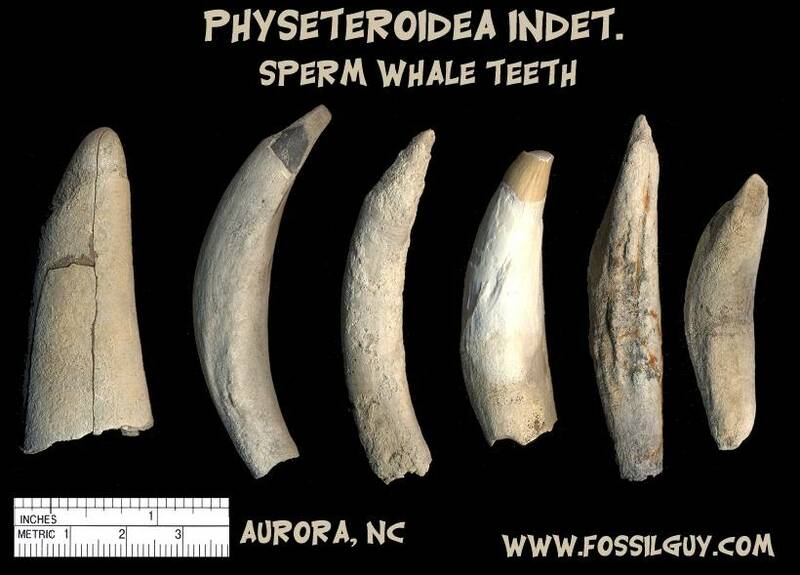 One of the more common whale fossils found in North Carolina are sperm whale teeth. They come in many shapes and sizes. For facts about Sperm Whales, go to the Sperm Whale Gallery. The teeth of Sperm whales have a huge variation with respect to one another. Because of this, identifying them to a species is next to impossible without an associated skull. These teeth are easy to identify. Their roots are hollow at the base, and when worn, show a pattern of enamel rings running up the tooth. These are more sperm whale teeth to show the wide variation in shape and size. Here is a much larger Sperm Whale tooth. Notice the shape variation from the ones above and below. As in most whale teeth, this one has feeding damage near the tip. This one is from the Yorktown formation in the PCS mine in Aurora, North Carolina. This is another larger Sperm Whale tooth. 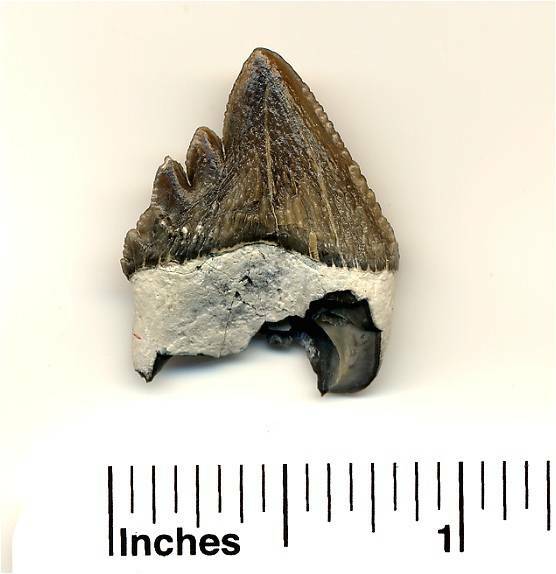 It also has feeding damage near the tip, as most of the enamel has been sheared off.It is also from the Yorktown formation in the PCS mine in Aurora, North Carolina. An Atlantic Right Whale, a Baleen Whale, skull. This skeleton is on display at the Charleston Museum in South Carolina. Baleen whales, or filter feeding whales, were the largest type of whale in the Miocene and Pliocene formations in North Carolina. 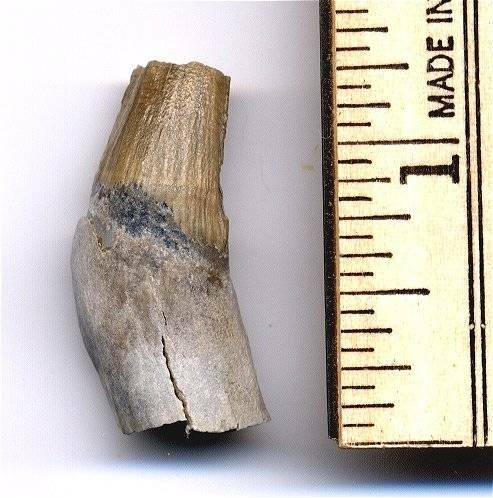 Usually only bone fragments and isolated large vertebra are found. 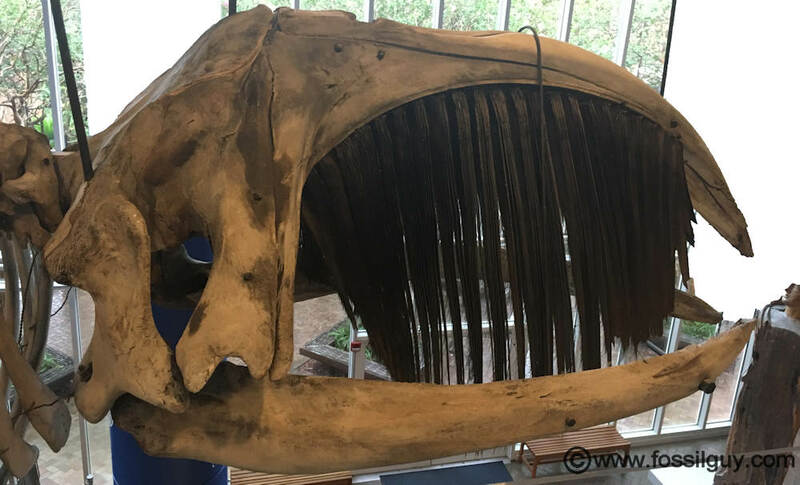 The Cone Whale on display at the Mace Brown Museum in Charleston- Found by Lee Cone of Friends of the AFM in the PCS Phosphate mine in Aurora, North Carolina. The ear bones (bulla and periotic) are very dense are usually the best preserved bone elements of the skull. These are two whale bulla. The upper one is better preserved. They are from the Yorktown formation of the PCS mine in Aurora, North Carolina. 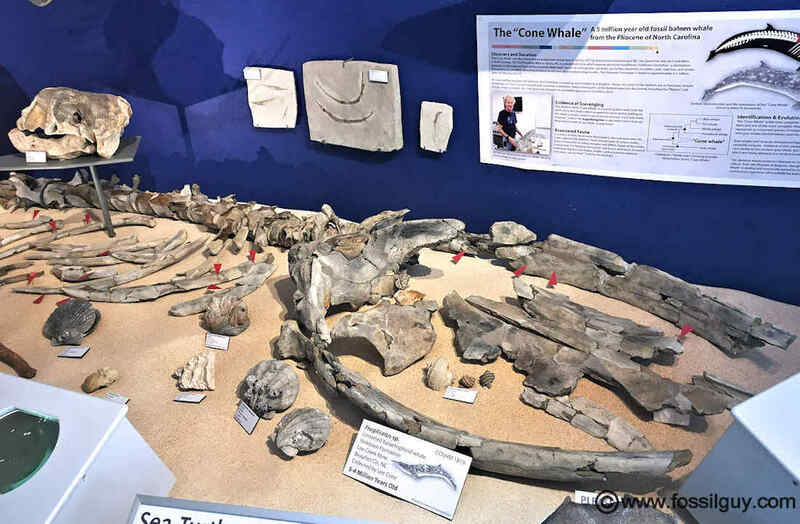 This fossil whale bulla has been entirely replaced by Phosphate. Phalalanges are finger digits. Cetacean finger digits have a very flattened shape. Carpals are the wrist bones that connect the radius and ulna to the phalanges (fingers). 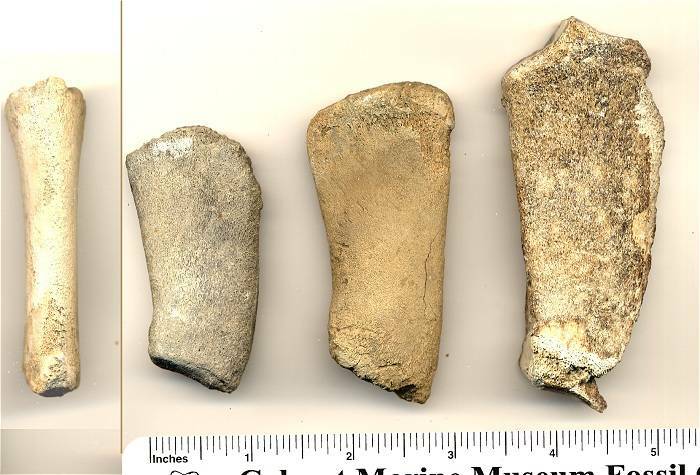 Whale bone fragments are common in the Pungo River and Yorktown sediments. Sometimes they are recognizable, as in the vertebra lower on this page and skull elements. This is a fossil whale parietal, or a top back part of the whale skull. 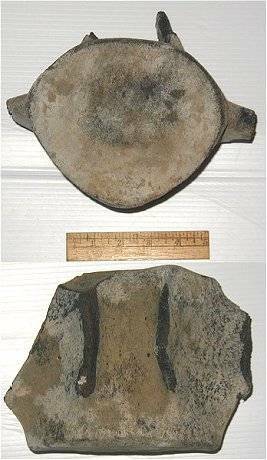 Whale vertebra are common in the Yorktown formation. They are easy to identify due to their large size and shape. 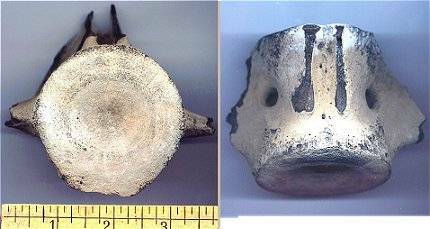 Below are various vertebra from different parts of a whale spinal column. The processes are almost always broken off. There are different types of vertebrae depending on the position in the animals back. Cervical: Vertebrae which form the head and neck veretebrae. Thoracic: Vertebrae, or Rib Vertebrae, form the upper back. Lumbar and Sacrum: vertebrae which form the lower back. Caudal: vertebrae which form the tail. The numbers of each type of vertebrae vary depending on the species of whale or dolphin. Some have only 41 verebrae, while others have 91 vertebrae! 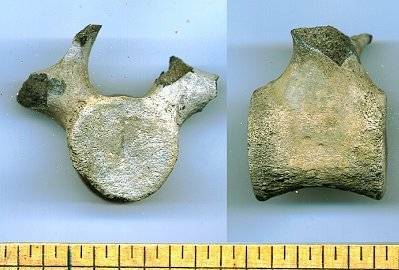 Usually, at the Calvert Cliffs, vertebrae have most of the processes (bony protrusions) worn or broken off, so only the central disk is left. 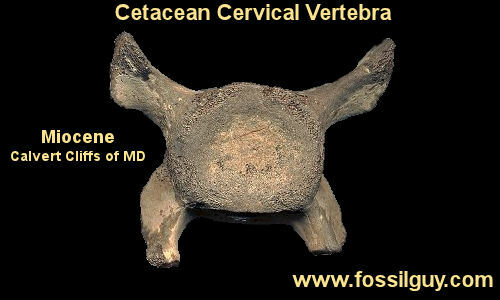 Often the genus or species of cetacean cannot be determined from an isolated vertebra, usually only the vertebra position can be determined. Cervical Vertebrae are the vertebrae that make up the neck. There are two special ones, the Atlas and the Axis which connect the skull. The others (C3-C7) are very thin. Many of these vertebrae are often found fused together. These are virtual scans of two whale cervical vertebral columns, showing the atlas, axis, and other cervical vertebrae and how they all fit together. This is from the "Whales of the World" scans from the Idaho Virtualization Laboratory at the IMNH. Image has been resized. Copyright: ( CC BY-NC 4.0). Cetacea and most other mammals, usually have 7 cervical vertebrae. After the Atlas (C1) and Axis (C2), the rest look very similar. In cetacea, they are highly compressed. Another Cervical Vertebra. This one has more of the processes still attached. Cetacea have somewhere around 13 Thoracic vertebrae, depending on the species. These are the vertebrae of the upper back and have the ribs loosly attached to them. The central disk is round and has process protruding from the upper sides of the vertebra. These processes branch into the transverse processes (where the ribs would attach) and a spinal process. 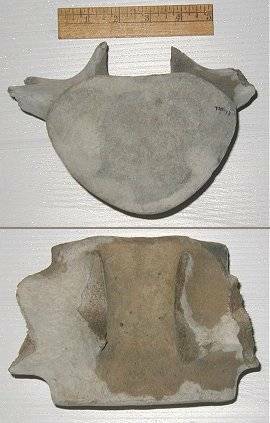 This is probably a lower Thoracic Vertebra from a whale. The processes are also mostly missing. Lumbar vertebrae are the vertebrae of the lower back. They go from past the ribs to the pelvis. 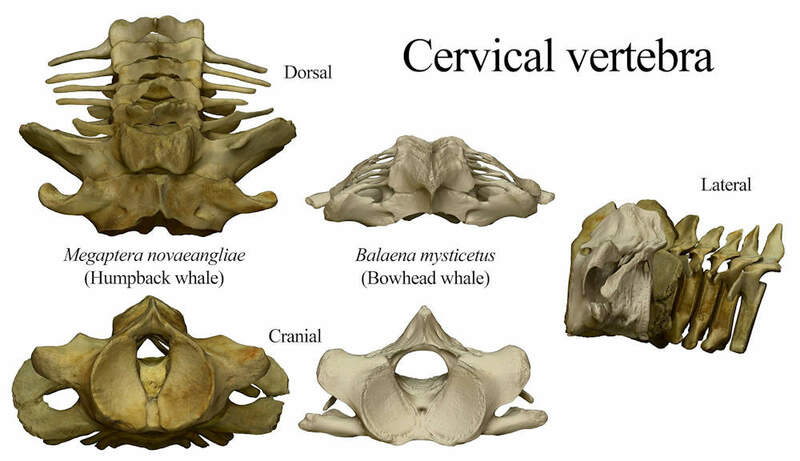 The number of lumbar vertebrae vary among ceteaceans. Whales have around 10 - 12 of them. Lumbar vertebrae have the transverse processes sticking out of the sides, while the spinal process is sticking out of the top of the vertebral disk. 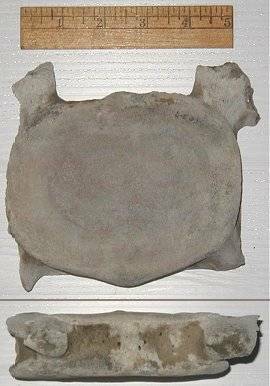 This is probably one of a whales Lumbar Vertebra. Again, The processes are missing. Caudal vertebrae make up the tail of the cetacean. They are very small and the processes are either severely reduced, or missing. 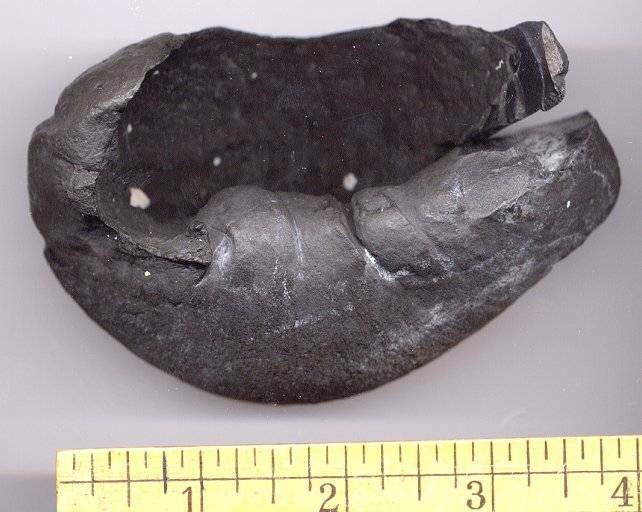 This is one of a whales Caudual, or tail Vertebra. The processes are mostly missing. 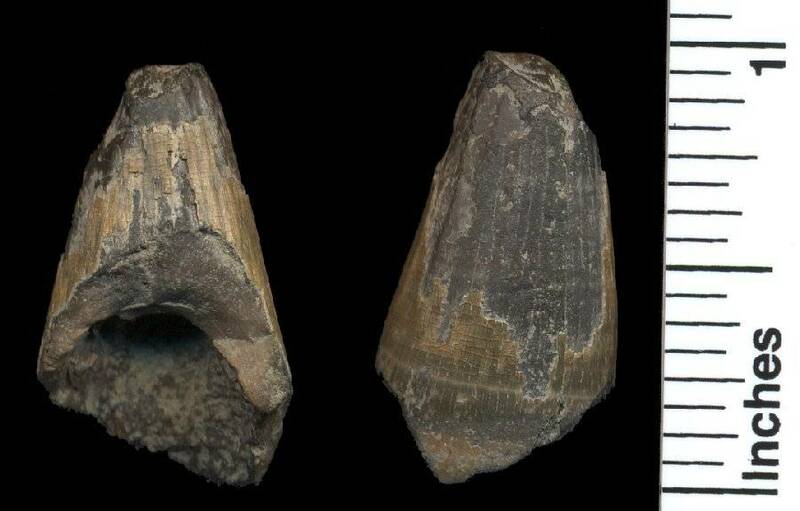 Crocodile teeth are occasionally found in the Miocene and Pliocene formations of North Carolina. This is the only nearly complete Crocodile tooth I have found. It is very worn. It came from the Pungo River reject pile in front of the Aurora Fossil Museum. Everything you wanted to know about Megalodon! Theres more than just Shark Teeth that fossilize! Your Guide to T rex. - All the research on Social Behavior, Diet, Speed, Strength, Types of Tyrannosaur, Skin and Feathers, and Much More! The Guide to fossil hunting in the Peace River of Florida - Fossil Identification, Locations, Water Levels, and More! Your Guide to C. Megalodon - All the research is here! Size, Diet, Evolution and Excintion, and Much More! The T-rex of the Cretaceous Seas, Your Complete guide - Types of Mosasaurs, Size, Diet, Skin, Color, Freshwater Mosasaurs and More!